Vegetarians & vegans, avert your eyes! This is a post for those who appreciate indulging in beef in all its glory, and we are part of this team. 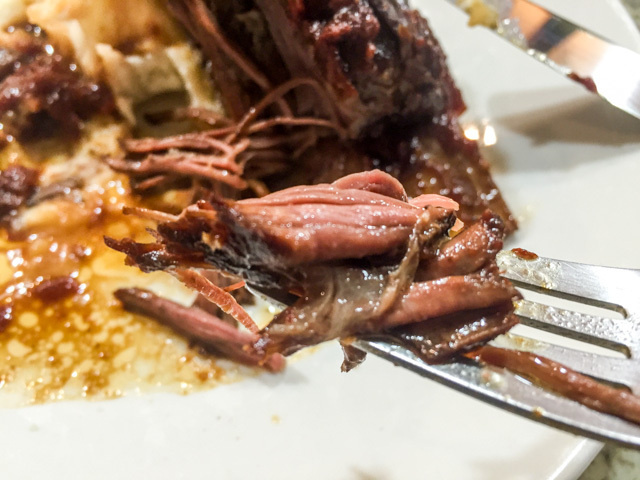 We need to have our beef-fix at least once a week, and do so with gusto… I was a bit surprised when I realized that this recipe from Fine Cooking was not in the blog, because I’ve been making it for years, ever since it was published in the magazine back in 2003. It is so simple to make, the only work involved is browning the ribs, but once you are done with that, it is cake. Actually it is braise. Three hours of the oven working for you, as the house smells better and better. Star anise is probably the only ingredient you might not have in your pantry. However, you should really get it because it turns this dish (and many others) into a complete winner. We enjoyed it on Valentine’s Day, which this year fell conveniently on a Sunday. Perfect day for this kind of cooking. I got started early in the morning, put the pan in the fridge so that the fat congealed to the surface, and skimmed most of it off before serving. Comfort food by definition. If you are a beef lover, you must make this before winter is over (and typing these words made me get up and do a happy dance). Position a rack in the center of the oven and heat the oven to 325°F. Put the tomatoes, 2/3 cup water, the soy sauce, vermouth, and brown sugar in a bowl and stir. Add the star anise. 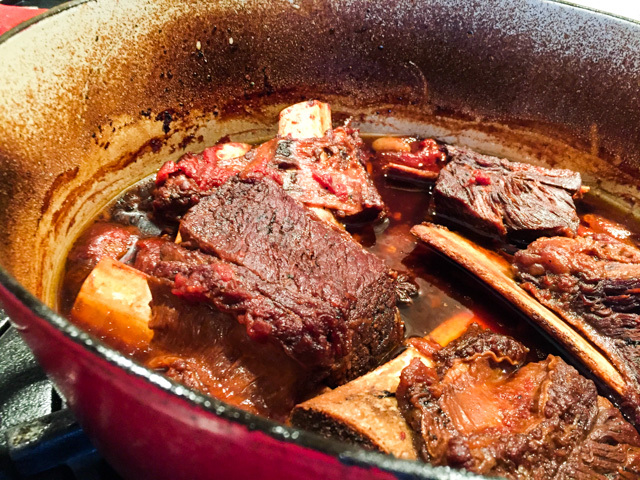 Pat the short ribs dry with paper towels and season them with pepper. In a pot that’s large enough to hold all the ribs in no more than two layers, heat the oil over medium-high heat. Put as many ribs in the pot as will fit without crowding and brown them on all sides. Transfer to a platter. Brown the rest of the ribs, adding more oil if needed, and transfer to the platter. Pour off the fat from the pan, reduce the heat to low, and add the ginger and scallions, stirring and pressing them against the pot, for 1 to 2 minutes to bring out their flavor. Return the ribs to the pot and pour the tomato and soy sauce mixture over them. Bring to a simmer and cover. 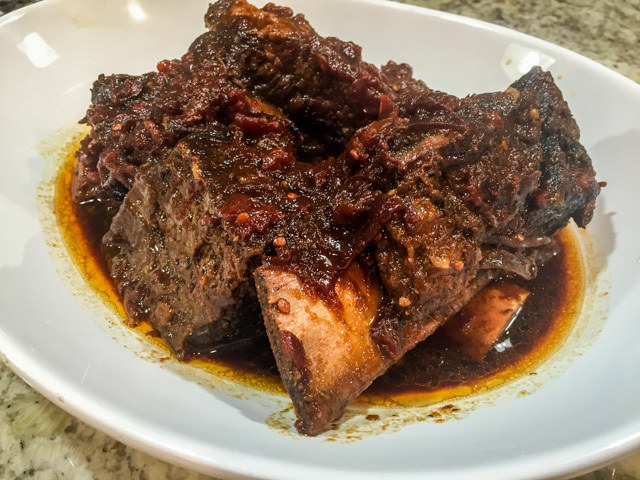 Transfer the pot to the oven and braise the ribs, lifting and turning them about every half hour, until the meat is very tender and starts to fall off the bone when pulled with a fork, about 3 hours. Transfer the ribs to a serving platter (or if you’re working ahead, transfer them to a baking dish; refrigerate, covered, when cool). Pick out and discard the ginger and star anise from the pot and pour the remaining sauce into a large, clear measuring cup. When the fat rises to the surface, after about 5 minutes, spoon it off and discard. If you’re working ahead, cool the sauce in the pot, refrigerate it, and skim the solid fat off the top. When it’s time to reheat the ribs, return them to the pot and heat gently in the oven. Comments: The picture above shows you what to look for at the end of braising. Bones almost completely exposed, and the meat begging to be pulled off, literally melting away from it. Fine Cooking says from 2.5 to 3 hours, I went for 3 full hours, then turned off the oven and left the pot inside for a little while, maybe 15 minutes more. I did have to add a bit more water 2 hours into the braise, make sure you pay attention to that. 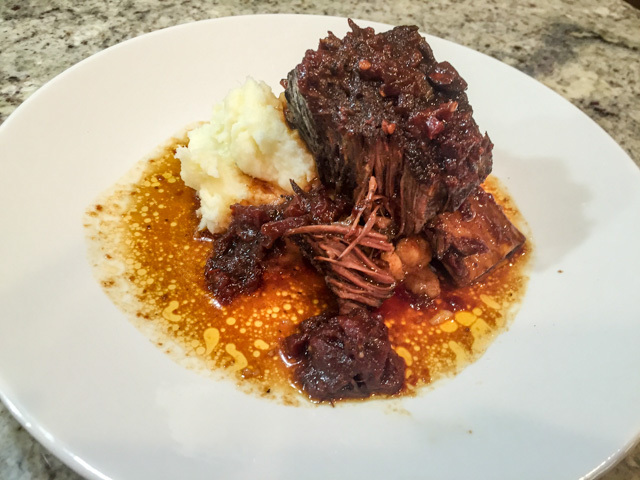 The star anise gives this sauce a very unique and wonderful flavor. We thought this dish would feel comfy in a restaurant run by Thomas Keller. It was that great! Meat super tender, luscious sauce, perfect match for mashed potatoes (or any other root veggie puree). Of course, cauliflower mash or polenta would be amazing too. A great option for entertaining, as you can make the whole thing a couple of days in advance, it will only get better as it sits in the fridge. A rustic loaf of bread to soak up the fantastic sauce is recommended.